Famed among Engineers as a master of mechanical motion, Frederick is perhaps less well know to those outside of either the Guild, or the Academy Interrata. He knows his way round Think Machines and many other engineering disceplines, but his life's work has been with robots, or golems to the less mechanically inclined. He is not among that rarest of rare groups who can create a sentient mind, but just about anything short of that and he's your man. It's fair to say that he's somewhat obsessed by this line of work, and spends most of his spare time crafting intricate automata for nothing but the joy of creating them. A useful hobby it turns out, for it earnt him a place at the al-Malik court on Criticorum where his creations sbecame must-haves for the noble classes. Sadly though, most were lost or destroyed in the Decados invasion. Despite the fame of these creations outside of the Guild, it's still his work at the Academy that he is best known for within it. Years of postgraduate study, research, leacturing and eventually also administration have cememnted him as a stalwart of the faculty, and one who might not have been posted anywhere else again were it not for the discovery of War Golems on Yathrib just as the Guild was hunting for a senior member to represent them on world. Standing at not many inches above 5', Frederick is well rounded but by no means obese. His light, sandy hair is greying at his temples and on top although it's perhaps slightly more noticable in his impressivly bushy sideburns. Piercing blue eyes sit above jovial cheeks and are pretected from the harsh light onworld bu a pair of faintly tinted sunglasses. To finish off it's only fair to say that his ears are entirely remarkable. His clothing might be classed as somewhat eccentric, but the crest of the Supreme Order of the Engineers that sits in prominant view possibly goes someway to explaining that. His feet are saved from the harsh sand by both socks and sandals, and while his shins are bare from knees to waist his legs are covered by a pair of beige shorts. 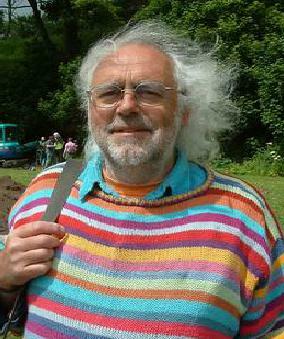 On his torso he wears a none-descript dress shirt over which, whatever the weather, he has a stripey, knitted jumper. It is on the brest of this garment, that the guild's crest is embroidered. To cap it all, on top of his head sits a plain straw hat to aid in keeping the sun from his features. Verity - Former student at the Academy. Good to see her out here, she seems to be thriving. Fiamma & Chiaka - So, I hear they have a terraforming engine. How interesting. Katerine - Another noble with work. Looks like I'll be busy here. Lysandra - Lady Constable, seems to have a sensible head on her shoulders. Academy Interrata - he's spent about half his life there and is a well known face among the Engineering Faculty. APSS - he's a fully signed up member and oft-time campaigner for the rights of Synthetic Sentients. Criticorum - he spent a few years before Decados invasion at the Court of the al-Malik Dukes. This page was last modified on 10 July 2013, at 13:00.